The Mr. & I had some friends over for dessert last night. Well, I usually make my popular pistachio torte. But I ALWAYS make that & wanted to try something different. I happened to see a facebook friend post a picture of a pumpkin roll she made that morning. And inspiration struck! 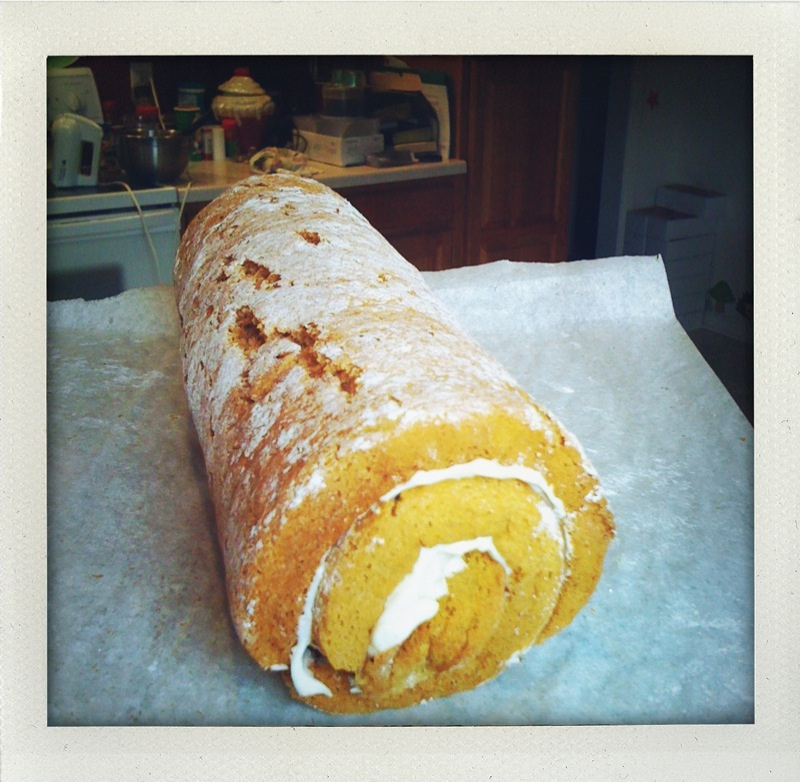 I baked the pumpkin roll in my kitchen while skyping with Tia, who was baking snickerdoodle cookies in her kitchen. We were a regular cooking show duo. It was a fantastic morning spent with my faraway friend. I used a cookie sheet for my "pan", which measured about 11 1/2" x 17" x 1/2" deep. And instead of waxed paper (which seems to always smoke & stink up my kitchen if I use it in the oven) I used parchment paper. ( I LOVE parchment paper.) I read the recipe reviews & a few people said they didn't separate the egg whites & yolks. I DID separate them, since it was my first time making it. I'd never whipped whites until they were stiff. It took a lot longer than I thought. When I rolled the cake, it started to split. You can see in the photo at the top. (It kinda looks like stretch marks. haha!) It didn't break all the way through, but it was kind of a bummer. Not sure what I could've done differently. It tasted yummy though! 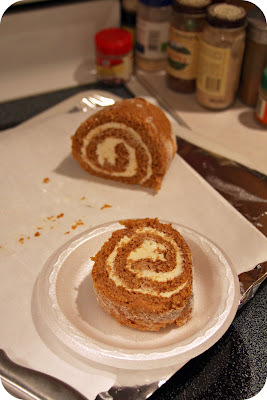 I mostly tasted the cream cheese filling, which is ok---but I'm a cake girl. It was nice to mix things up, give my pistachio torte a break & try something new! As I sliced the cake, wonderful smelling coffee was brewing, tea was steeping, & hot cider was waiting to be poured into happy mugs. It was a delicious evening indeed!! Also, powdered sugar helps with the cake "breaking". I sprinkle the cake after it has cooled and before I flip it onto a towel. Then I sprinkle more once flipped and before I roll up in towel to cool. (I then place in the freezer to cool.) And I sprinkle MORE powered sugar on the cake after I add the filling and am rolling it for the final time.